Quentin Palfrey, like Jay Gonzalez, is running for office for the first time. One after another, Ayanna Pressley, Alexandria Ocasio-Cortez, and other Democratic stars whipped up the demonstrators into cheers and chants. Behind them stood Quentin Palfrey, just another face in the crowd at last week’s rally against Brett Kavanaugh’s nomination to the Supreme Court. In some ways, playing second fiddle is part of the job description for Palfrey, the Democratic nominee for lieutenant governor. But the burden of anonymity is even heavier when you’re the understudy to Jay Gonzalez, the Democratic nominee for governor, who — despite getting a speaking role at big events — remains unknown to almost one-quarter of voters, according to a recent poll. Even diehard party figures might be hard-pressed to identify who Palfrey is and what he stands for. Like Gonzalez, Palfrey is an accomplished attorney and first-time candidate who has worked behind the scenes in politics and government. And like Gonzalez, he argues Massachusetts has lost its historic role as a progressive state, a vanguard position he vows to restore through investments in education and transportation. The challenge will be raising his visibility when his running mate had just $200,000 in the bank as of Sept. 30 and is trailing almost 40 points behind Baker, the popular Republican incumbent who is using his $5 million war chest to blanket the state with TV ads. Palfrey said he is confident he and Gonzalez can ignite a grass-roots movement, one room at a time, over the next month. The two mostly campaign separately to cover more ground. In running for office, Palfrey, 44, is following something of a family tradition. He is a great-great-grandson of Theodore Roosevelt, and his family traces its roots to early 17th-century Salem and includes an aide-de-camp to George Washington, a 19th-century congressman, and a member of John F. Kennedy’s Atomic Energy Commission. Palfrey’s parents are both pediatricians and longtime faculty deans at Harvard, and his mother was appointed by Michelle Obama to lead Let’s Move, the childhood obesity initiative. A graduate of Phillips Exeter Academy, Harvard College, and Harvard Law School, Palfrey worked in the Massachusetts attorney general’s office from 2005 to 2009, leading the health care division during the rollout of the state’s universal health care law. After Barack Obama took office, he was deputy general counsel in the Commerce Department and then senior adviser for jobs and competitiveness in the White House Office of Science and Technology Policy. In that role, he helped pass a major overhaul of federal patent law. Most recently, Palfrey was executive director of J-PAL North America, an MIT center that researches antipoverty policies. He stepped down from that job to run for lieutenant governor in August 2017 after watching the deadly white nationalist rally in Charlottesville, Va., he said. The lieutenant governor has two official duties: to fill in when the governor is absent and to serve on the Governor’s Council, which confirms judges. But many assume broader roles. Baker’s lieutenant governor, Karyn Polito, serves as a liaison to cities and towns and works on sexual assault and Seaport policies. Palfrey said, if elected, he would work closely with local officials, use his experience in Washington to help with federal affairs, and push for judges who will protect civil rights. “The office of lieutenant governor, if it has someone who has spent their career on poverty and inequality and the challenges of ordinary people, can be a great platform,” he said. Unlike Republican governors and lieutenant governors, who traditionally run as a ticket in the primary, Democratic voters pick their lieutenant governors in a competitive primary and that person becomes the running mate of whoever wins the gubernatorial primary. 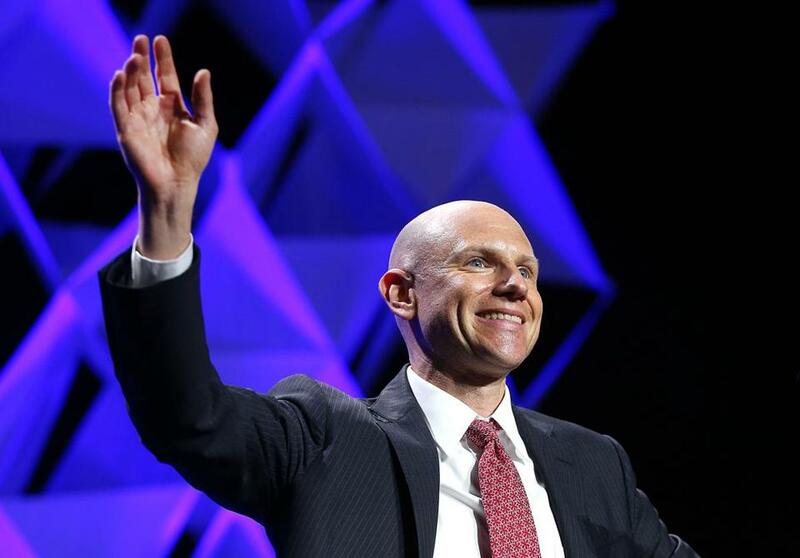 Palfrey, who defeated comedian Jimmy Tingle in the September primary, has formed what he called a “perfectly aligned” union with Gonzalez, a former Patrick administration budget chief who won his primary against Robert Massie. In keeping with running mate tradition, Palfrey has also become the campaign’s designated attack dog, taking particular aim at Baker’s moderate credentials. “A vote for Charlie Baker is a vote for a lot of Donald Trump’s agenda,” Palfrey said. He pointed to Baker’s backing of Geoff Diehl, Senator Elizabeth Warren’s Republican opponent, who was cochairman of Trump’s Massachusetts campaign; fund-raising for Jim Lyons, a Republican state representative who opposes LGBTQ rights; appointment of Ronald Amidon, a gun rights activist, as fish and game commissioner; opposition to legislation that would limit police cooperation with federal immigration authorities; and the governor’s plan, abandoned last summer, to send the National Guard to the US-Mexico border. Terry MacCormack, a spokesman for the Baker-Polito campaign, rejected Palfrey’s criticism. “Governor Baker and Lieutenant Governor Polito did not vote for President Trump, have consistently disagreed with and advocated against federal policies misaligned with the best interests of the Commonwealth on issues like health care, immigration, and climate change, and remain focused on running their own campaign by communicating directly with Massachusetts’ voters about their administration’s bipartisan record of results,” he said in a statement. O’Neill, echoing other Democrats, said that, despite Baker’s forbidding polling and fund-raising advantages, the race remains competitive simply because of the state’s liberal leanings and the restive national mood, fueled locally by voters’ strong distaste for Trump.